← Paris May Be A Good Idea, But the Cote d’Azur is Always a Better One! The Magic of Rondini..and Working the Soldes! I’m taking a pause before I write my last installment about our trip and the return to Paris from the Cote d’Azur. This is important travel information! I’m talkin’ shopping my friends. S.H.O.P.P.I.N.G!!! I need to discuss Rondini. I need to discuss the soldes . I need to discuss the experiences. Please. I’m not preaching nor do I want to come across as sanctimonious. It’s just that over the years, I’ve acquired some savoir-faire in connection with these sales. Trust me; I’ve been extremely fortunate in the timing of our trips to France. We have always managed to be in France either during the summer soldes (sales) or the winter soldes! This summer’s soldes begin on June 24th and end August 4th. Those prayers to my guardian angel have paid off—she was at my side to ensure I got great deals this year. 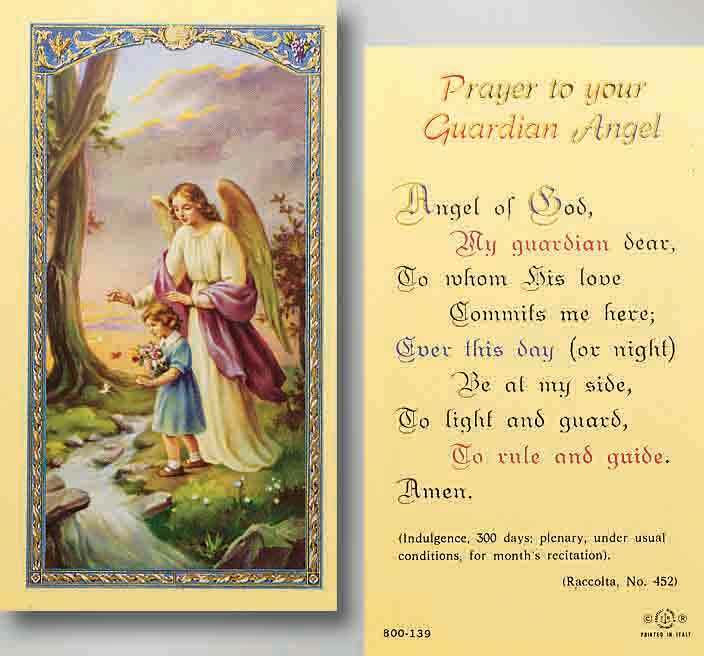 Hey, Guardian Angel, can I pray to you to find great sales because I just could NOT find the patron saint of shopping! Enough of my rambling. Let’s get down to business. OK? Rondini site–English Version Just For You! Way back when, in younger and more delusional days, I had seen pictures of Rondini sandals in magazines and read about how wonderfully made these sandals were. I imagined myself on the beach of St. Tropez—big hair, sunglasses, tanning, thin and totally glamorous. Never imagining that I would actually have the opportunity to be in St. Tropez and own these fantastic sandals years later! The Rondini studio is small. And charming. The Rondini sign always warms my heart and gives me happy feet! The first sandals I purchased were the “Sahariennes“. A leather flip flop of sorts. 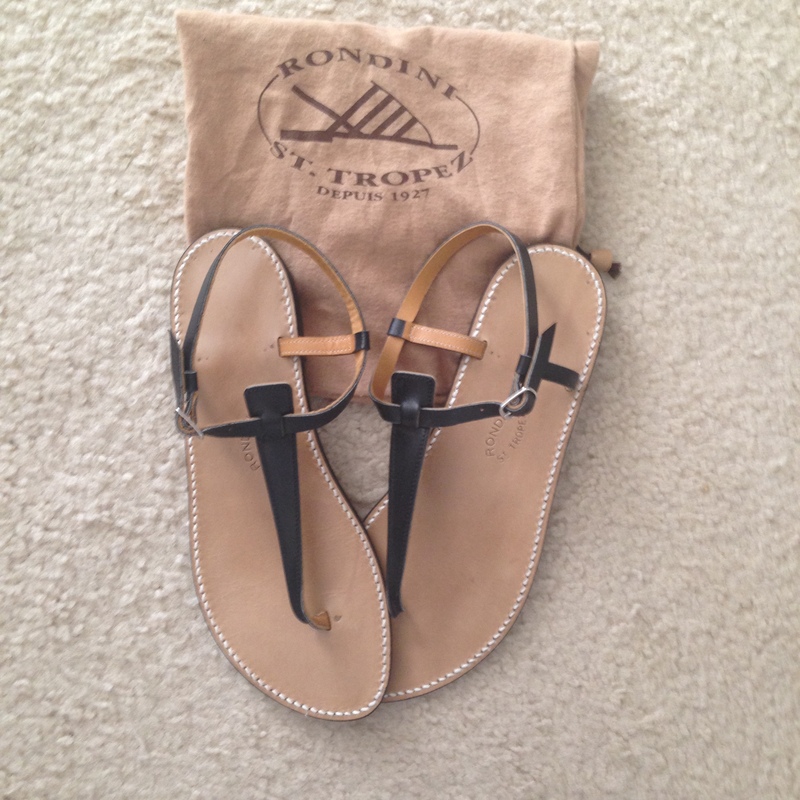 My first pair of Rondini sandals. They have gotten even better with wear after over 5 years! I love these so much! I’ll never forget arriving at the shop. A line was forming outside the front door. The inside was a bit dark and rustic. It was hot. I almost felt a bit intimidated because I was not a cool, chic, jet-setter—the kind that is often associated with St. Tropez. In looking around the shop, though, I noticed the customers were of all mixes. Hippies, St. Trop Chic, Prepsters..and me. It was all good! The level of service was far and above any footwear service I’ve received in my adult life. 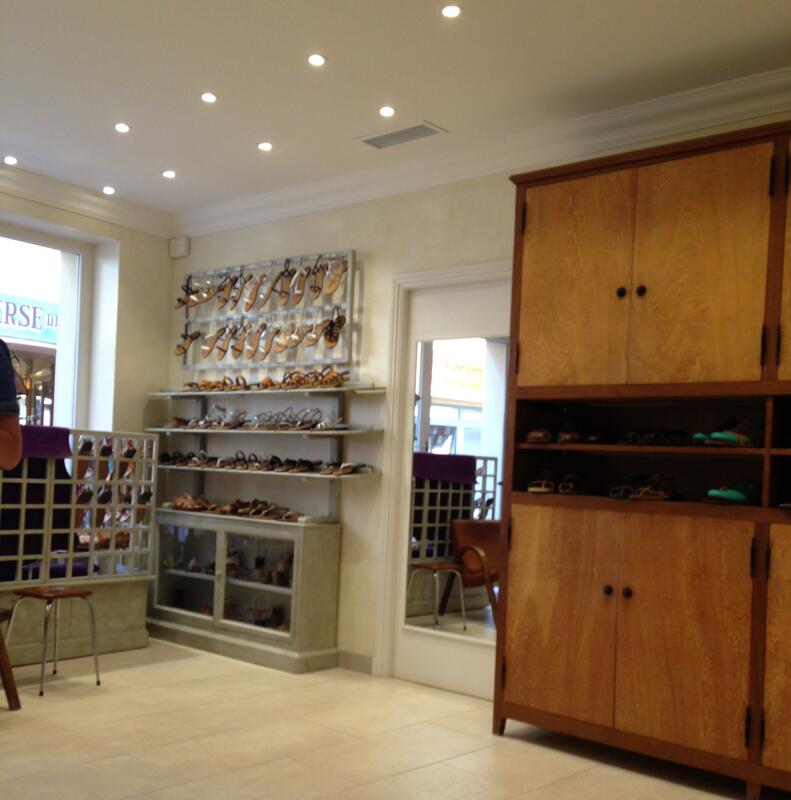 The service reminded me of old school shoe stores. You know– think back to childhood when your feet were measured and care and interest was taken into account for your school and special occasion shoes. My foot was carefully measured. The straps—even those non-assuming flip flop straps, were measured to my width. The sandals were custom fit just for me and only for me. 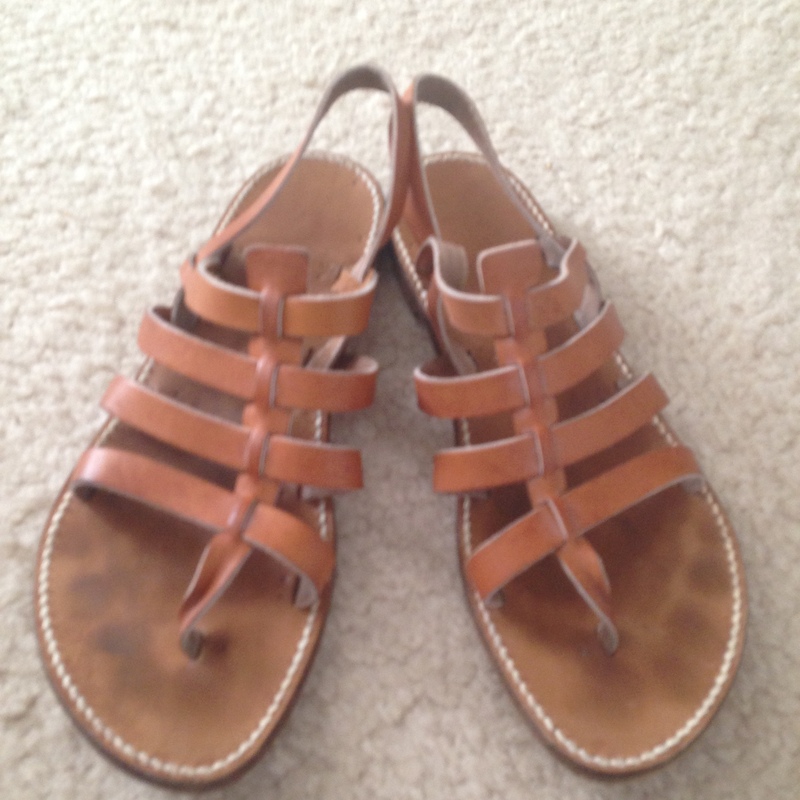 As time went on, those leather sandals molded to the shape and form of my feet, giving me the most comfortable fit ever. 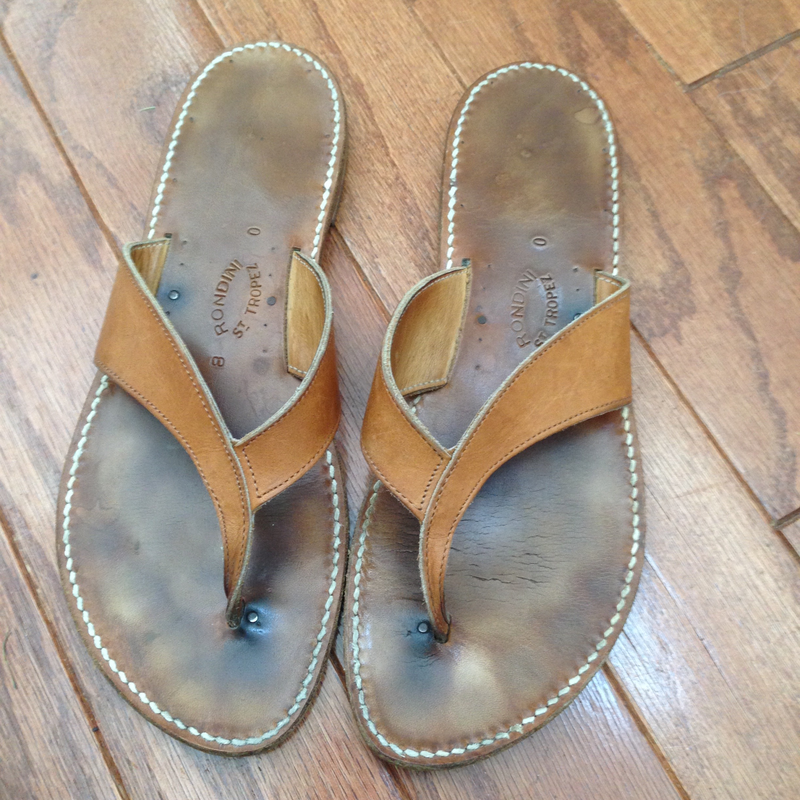 Over five years later, I still wear these magnificently fitted sandals regularly during three seasons—giving them a rest only during the coldest months of the year! My next visit to Rondini was a couple of years later. Same familiar shop, but this time, we arrived earlier to avoid any lines! The choice this time around was the infamous “Tropéziennes”, a gladiator-type sandal that is extremely popular. All throughout the South of France knock-offs of this model of sandal can be found. But if you want the real deal, and a superior quality sandal, Rondini’s are the best and original! My Tropeziennes. Again, so comfortable and so well-made. The sandal on your left-hand side is the one that was repaired. Good as new–the best repair job ever! 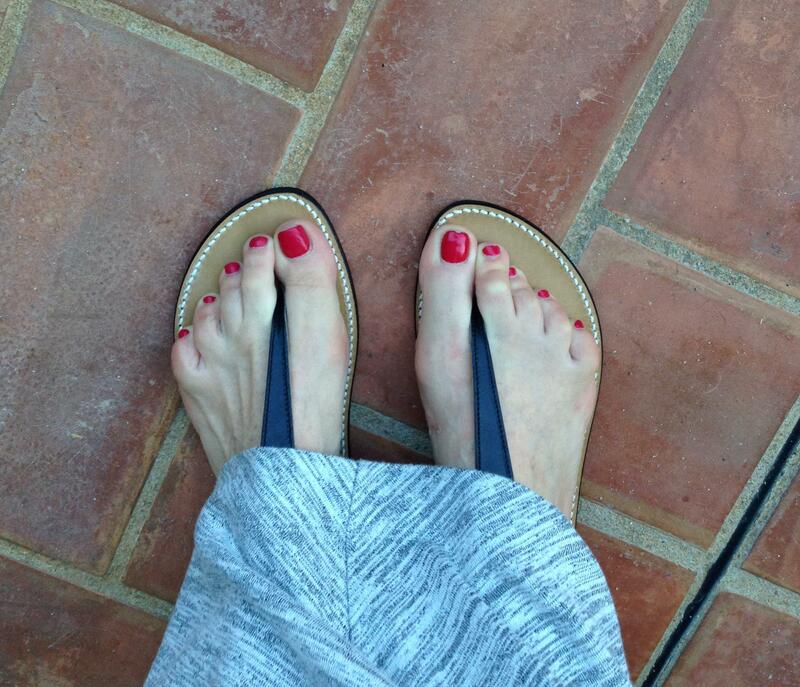 If there is any one pair of sandals that has gotten more compliments, it’s this pair. They are casual enough for dressing down yet, there is a certain chic quality for work and dressing them up. Then Chippy got to them. He may LOOK innocent, but he loves my Rondini sandals in a different way. He wants to eat them! A closet door had been opened. The scent of the natural leather must’ve been akin to the things that happen to me when I smell an opened jar of Nutella. He went crazy snacking on one of the straps. Luckily, I snatched the one sandal before he made a meal of it. However, my OCD wouldn’t allow me to wear them until the strap was repaired. See the damage of Chippy’s little entrée? I couldn’t find a repair shop here in the U.S. to repair the damage. 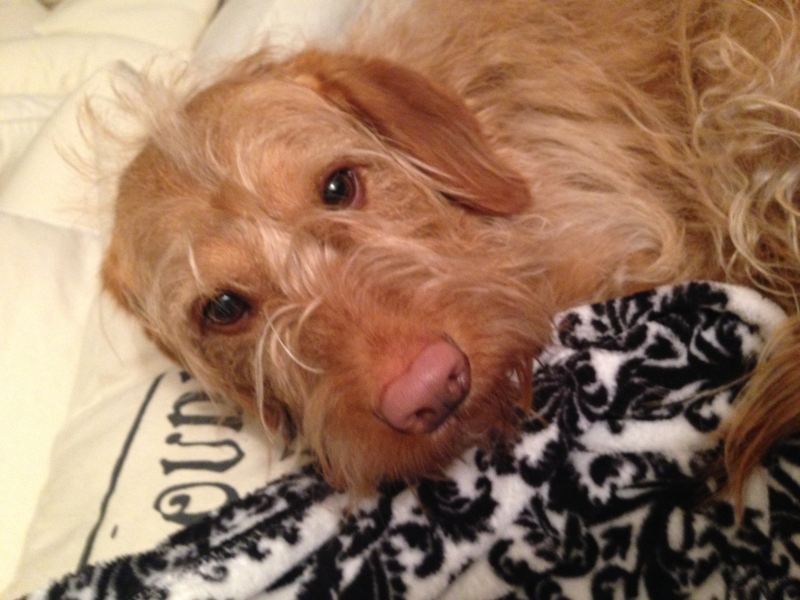 Instead I would have to wait until my return to St. Tropez. A couple of weeks before our recent trip, I contacted the Rondini studio with photos of the damaged sandal. I was told to bring the sandal in and it would be repaired. I was also told that the color of the new replacement strap may just be a little different. Hey. I didn’t care! Bottom strap repaired. I was told the color could be slightly different, but within a few weeks, the leather will be the same worn color. 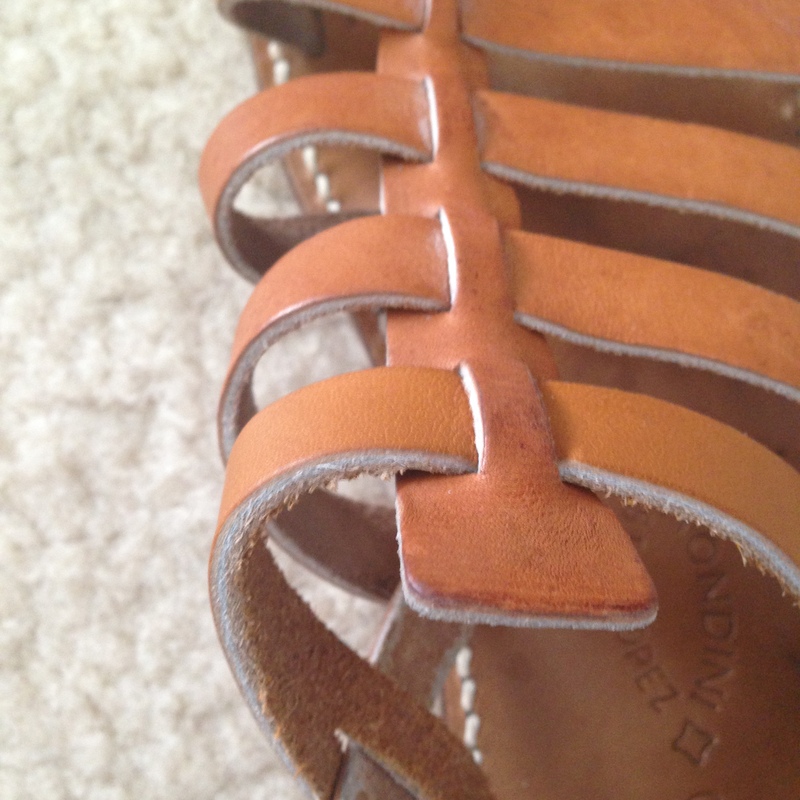 Excellent repair job and now I can wear my lovely sandals once again. And–remember to close my closet door! So—damaged sandal in my luggage, off we went! We were meeting Bonaparte’s dad, Dany, at his musee, Maison des Papillions, at 11 AM. We arrived in St. Tropez at about 9:45—which gave us plenty of time to get to the shop and then do some walking around the harbor. La Maison des papillons information for you! Shameless plug. I know–but’s its a great place to visit. When we arrived, I noticed the shop had a new and updated look! And—air conditioning! The shop is more open and airy and it is still charming as ever! The selection of sandals is mind-boggling. Leather in different colors, metallic leather, python leather. Oh, and the scent of leather is just so swoon-worthy! Rondini’s updated interior. Who wouldn’t want to spend time here? It is the most incredible shop! It still smells like an old-school leather shop! The “door” leading from the boutique to the workshop in the back remains in beaded strands hanging from top to bottom. You can see the talented artisans creating and working on the leather goods! We dropped my damaged sandal off, with absolutely no expectations of repair time. Honestly—we expected to either have the repaired sandal sent back to us via mail or we expected to return a couple of days later. What we didn’t expect was to have the sandal fixed in a matter of hours. I had my sandal in hand after our lunch with Bonaparte’s dad! 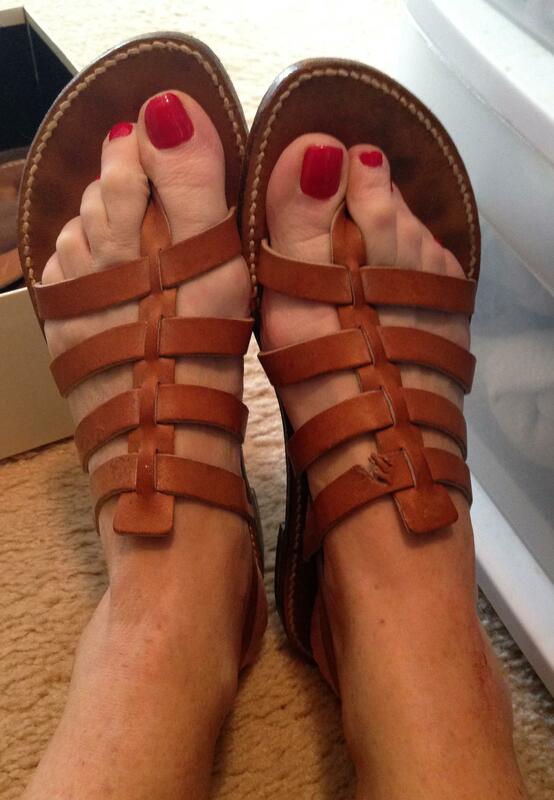 I also purchased another pair of sandals. This time, at Bonaparte’s suggestion, I went with the “Salome Box” in black leather. Although they weren’t part of the sales, the 135 Euro price was well-within my budget and equivalent to $150 USD! …they looked great all dressed up in my maxi dress when we dined at L’Aiguille! From the moments that my foot was measured, until the moment I left the shop, I felt like Cinderella when the glass slipper was placed on her foot. Fitting and re-fitting. Even after the straps were placed on the sole, they were measured for more little holes so that the fit would be perfect. It’s hard to explain the feeling of having such care and professionalism that goes into the experience of purchasing a pair of Rondini’s. It’s just so personal and intimate! The assistance received was so generous and genuinely caring. I felt even more “special” when, after Bonaparte made the purchase, he was asked if Dany was a relation. When he explained that he was, in fact, Dany’s son, we found out that Dany is a very well-respected person in the St. Tropez community. THAT really touched Bonaparte to no end. He was just so happy and proud for his dad! The great attention to the customer, the attention to detail, the fact the sandals are made in France, AND the fact that the product is superior will have me purchasing my sandals from Rondini from now on. Seriously—have you seen the prices of “designer” sandals at department stores? 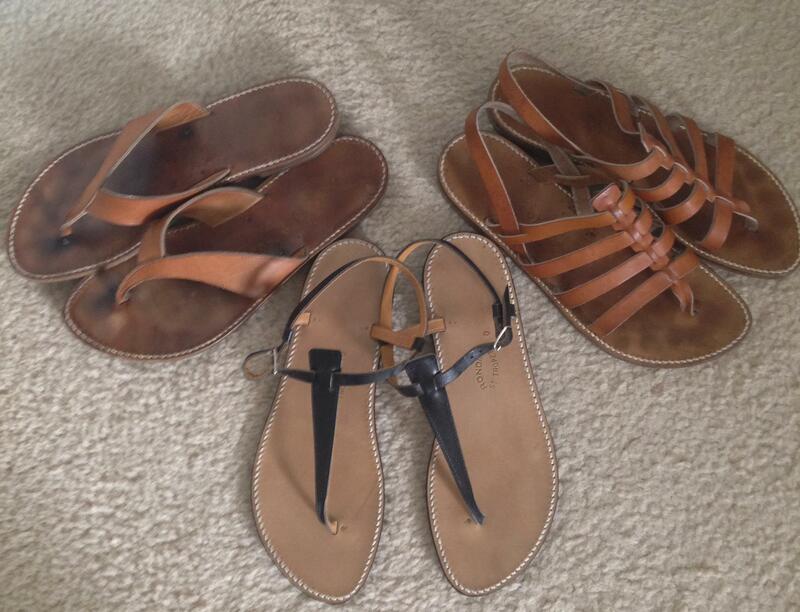 For about the same price, you can have a pair of custom-made sandals that aren’t mass-produced! My little Rondini family. Does this make me a regular customer? Seriously, the sandals are like a fine wine–they improve with age! For me, these sandals are a logical purchase. Although not on sale, the pricing was still a great value for the service and quality. An additional great thing about Rondini is that you can purchase the sandals through their website. I’ve already placed their handmade leather bracelets on my list along with the “Bikini Chevreau” sandals….or should I get the Saint Raphael, (? ), for my next visit! The “Bikini” on the left or the “Saint Raphael” on the right? Both are beautiful! What better souvenir can you bring home from France? It’s one that you will have for years and years and will grow better with age! Now. As far as clothing goes, I usually don’t make those purchases. The reason being is my body is incredibly curvy for a European fit. Even at my low weight, it is still difficult for me to find clothing when I’m in France. My past clothing purchases are a couple of simple dresses and a loose-fitting tunic. Most of the clothing purchases have been for Oona. During the sales, (I’m going back to “sales” instead of “soldes”), I try to strategize. For example, even though Longchamp bags are readily available here in the States, the pricing during the sales in France is incredible. In Galeries Lafayette, quite possibly the prettiest and most magnificent department store I’ve ever shopped in, the line just to get into the Longchamp area is ridiculous. I waited on that line some years ago and swore I would never, ever do it again. 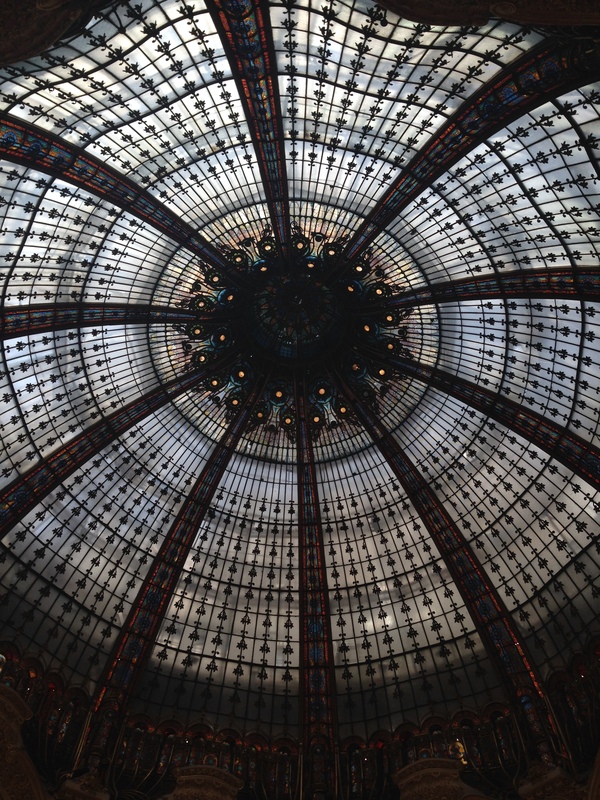 Ceiling dome at Galeries Lafayette! Two more shots of this magnificent department store. It’s so lovingly maintained–and crowded! 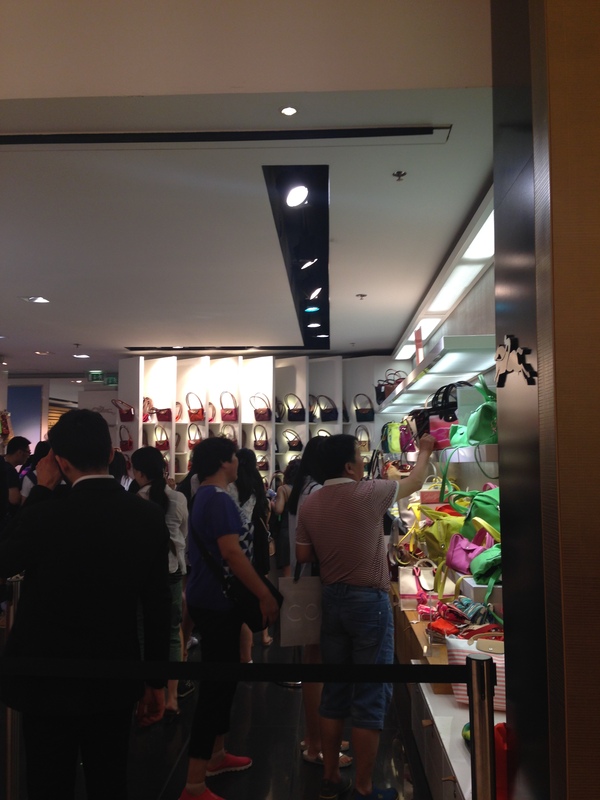 This is just a part of the line to make Longchamp purchases–and I’ve seen it worse! Here’s another view. It’s organized though. You pick out your bag, you receive a card with the information, you hand the card to the cashier, you pay and then you receive your bag. Its crazy! Instead, I opt for my Longchamp purchases at the airport. I swear you can get a better deal and there are no lines. 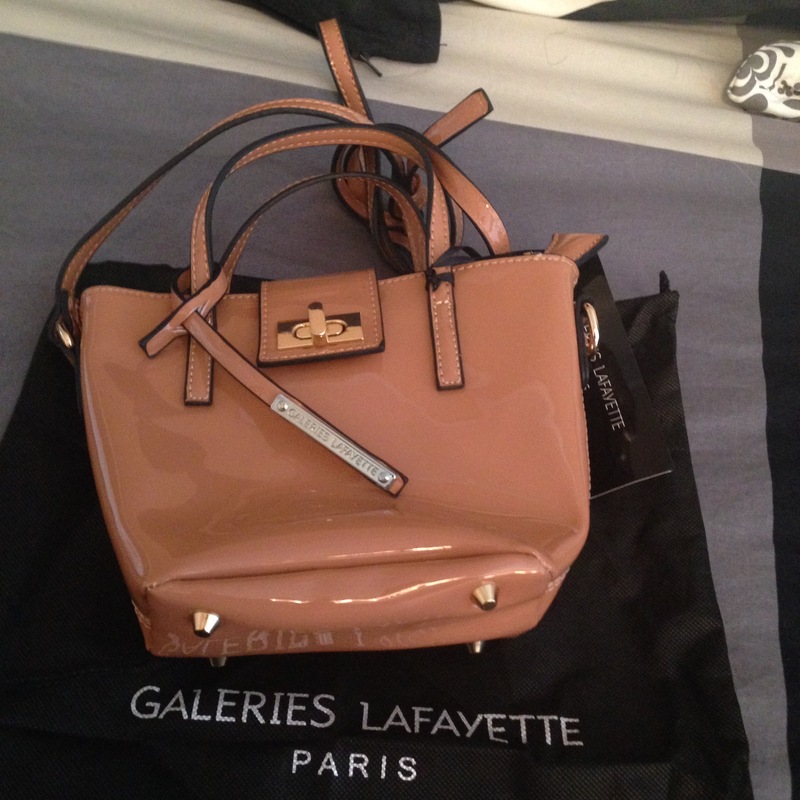 I purchased this bag at CDG for 49.50 Euros. In USD that’s currently $55.00. This bag normally sells anywhere from $155 USD and up. Now THAT is a great deal! The best deal was saved for last. I purchased this at CDG moments before I boarded the plane back home. It was a steal–literally, a steal–the best bargain ever! Repetto ballet flats are another favorite shoe of mine. Repettos, like Rondini sandals, are also made in France. A quality shoe. This display is like candy for me. Look how colorful and pretty! I hit pay dirt when I found this pair at Galeries Lafayette for half price! I paid 92.50 euros for a pair that is normally 185 euros. I also love the fact they are patent. 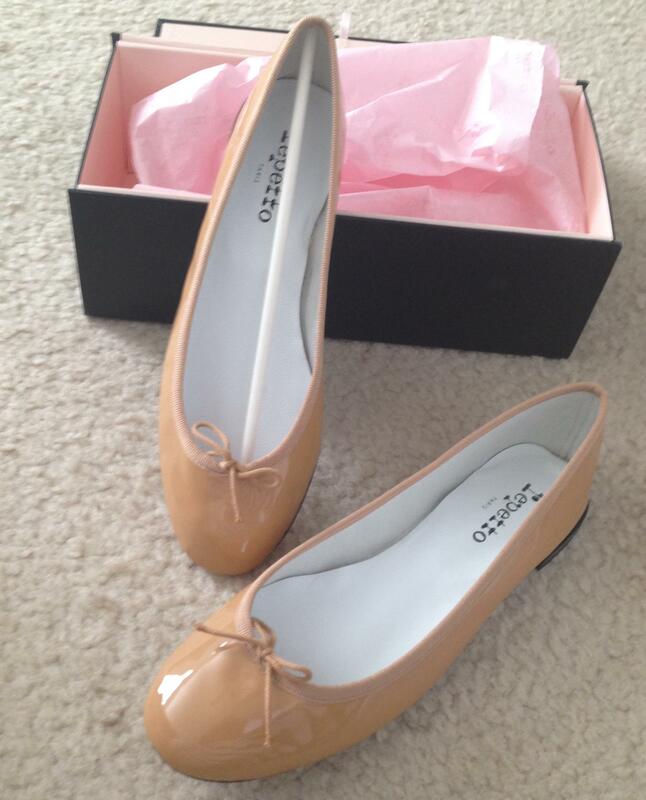 In USD the price is 103.00—still a great buy on a pair of Repetto flats. This is also a shoe that lasts forever! Aren’t they adorable? I love, love, love the color! Barbie got me hooked on these bags. I’ve purchased a couple for me and a couple for my daughter, Oona, who is also a fan. My Nat & Nin “Carrie” bag. This color is great and I know it’ll be receiving lots of compliments! Although I didn’t have time this time around to visit the Nat & Nin flagship boutique, I made my purchase at “Sophie Sacs”. 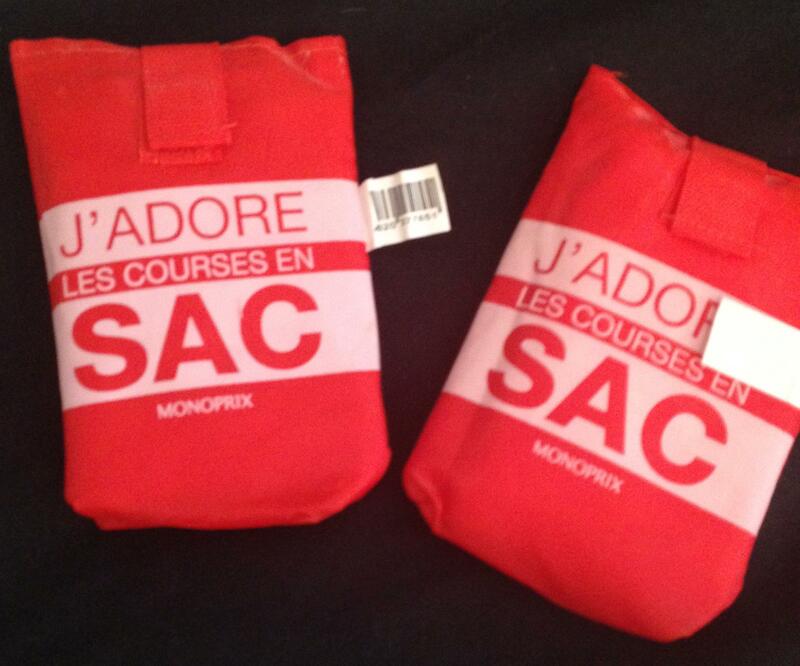 Sophie Sacs is the remarkable little leather bag shop on Rue du Rennes that sells these bags at great prices! 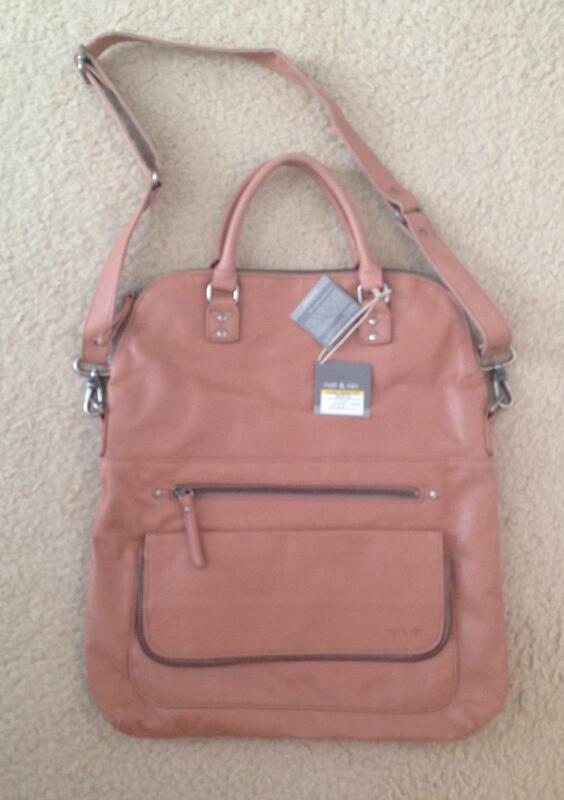 This bag was my most expensive purchase—at 188 euros, the USD equivalent being $209 USD. Even at $209 USD it is still a great deal. I don’t want an overpriced, mass produced Michael Kors bag that everyone has— nor can I afford the LV Neverfull bag at this point. Instead, I’ll opt for a more affordable bag that is a rare sight to behold here in the States! 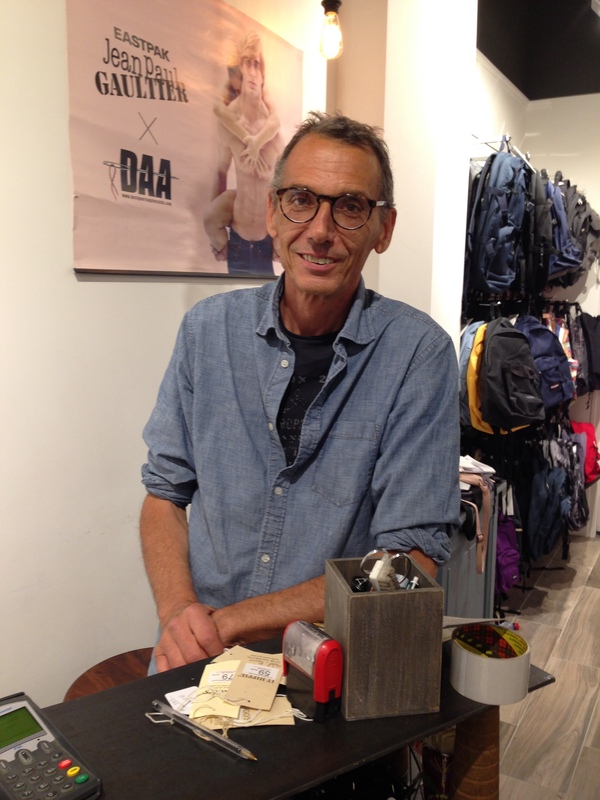 The owner of the great bag shop “Sophie Sacs”–it is always a pleasure to shop here! I was extremely pleased to be slightly under my overall budget of $500 USD that I had miserly saved up throughout the year. My major purchases were well-thought out and strategized. Tip: If you see something that may not be on sale, but you truly love it and will use it a lot—by all means if it falls within your budget—make the purchase. If you don’t, you may regret it. Tip: Don’t ignore the sales at the airports. CDG and Orly have some great shops. Nice airport has some great shops as well. 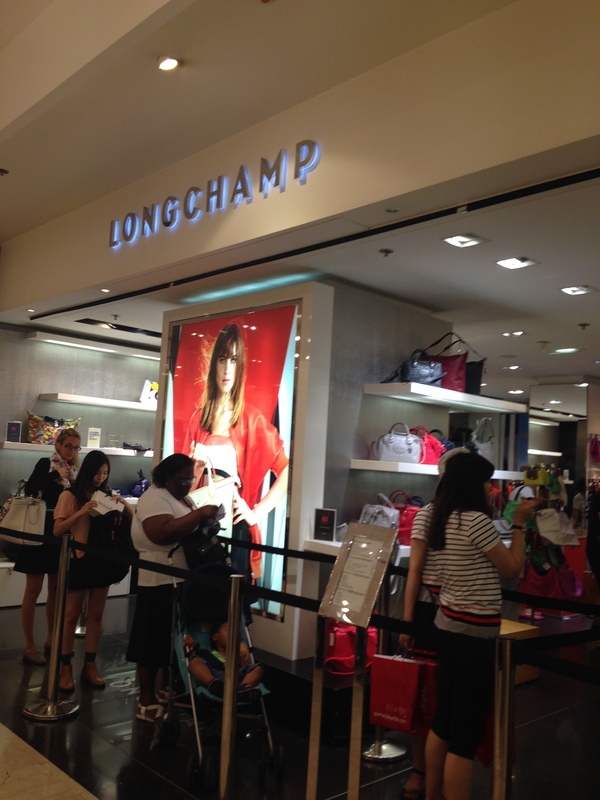 The Longchamp shop at Nice has fantastic buys! We did make other purchases too. Oona insisted she didn’t want anything but it was nearly impossible to pass this adorable cross-body bag up. She’s young. She goes out at night. Who wants to lug a huge purse around? This bag does the trick. (I filled it with little goodies too!). We happened to stop by Galeries Lafayette in Cannes—a very small store compared to the one in Paris, but it was just one of those finds! This bag is so adorable. I filled it with goodies like candies, a shopping sac and some Euros! 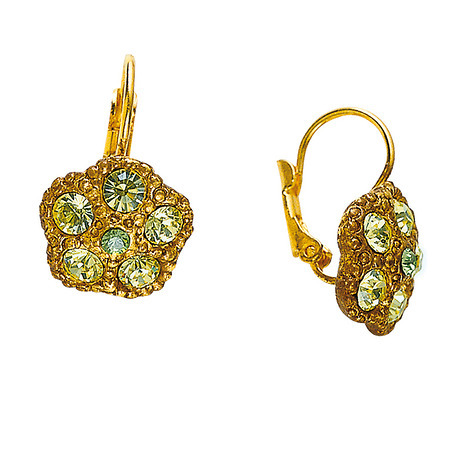 I also purchased a pair of earrings for her at this great little antique shop around the corner from Place Dauphine. I found this pic online. These are the earrings I got Oona but they are wrapped up and I’m not rewrapping them. She hasn’t gotten them yet! I’ll tell you—great finds sometime come when you least expect them. This beautiful little shop’s proprietor, Raphael Bedos, has excellent taste. His antiques are beautiful and the jewelry he sells in his shop are tasteful, classic, beautiful and surprisingly affordable pieces. I was glad to stumble upon his shop because I’ll be returning for more purchases in the future! 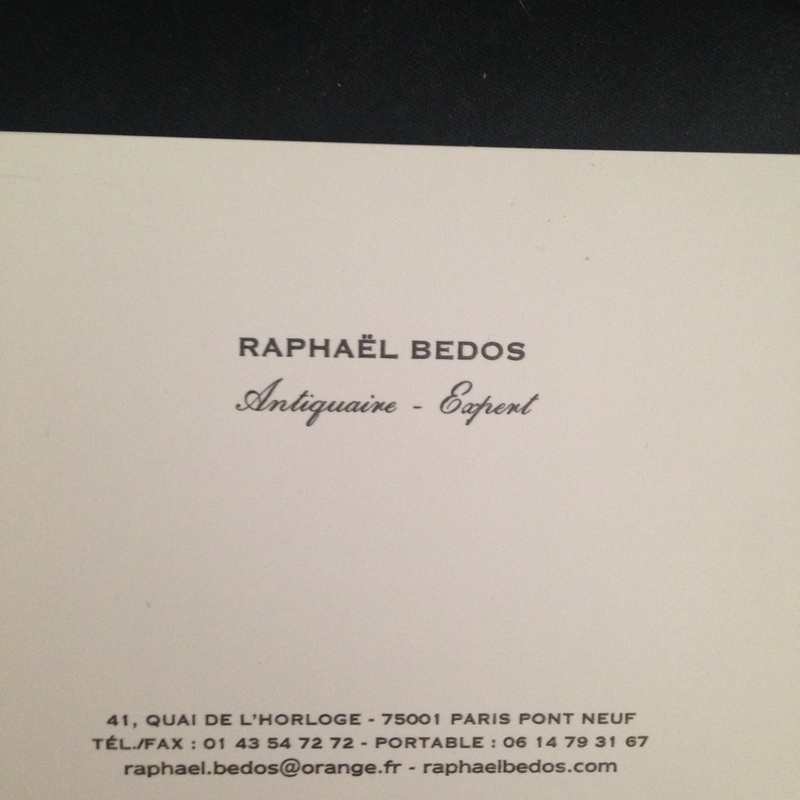 If you are in Paris and are near Place Dauphine or in and around the 1st or 6th ads., make a point to stop by his shop. He’s got great items and he is an incredibly nice man! Tip: Look outside the box when it comes to memorable purchases. I’m not a big fan of tacky souvenirs, but I do like to make little purchases that’ll remind me of my time spent in France. That’s where the cooking magazines come in handy! Translating the recipes is actually easier than you would imagine—it turned into my pet project. Last night I made cocktail tomatoes stuffed with crabmeat. I got the recipe from one of the magazines! It is also a fun way to improve your French language skills! They may not be haute cuisine or fancy French cookbooks, but the recipes are great for every day cooking–and pretty easy to translate once you get the hang of it! I also picked up a couple of gossip magazines. Hey—don’t judge! Jean Dujardin’s girlfriend is pregnant! It didn’t take him long to bounce back after his divorce now—did it??? Gossip magazines are just plain fun–and I forgot–Real Estate magazines are not only interesting BUT they are FREE! What a great souvenir! You can’t go wrong with music CD’s either! Over the years, I’ve amassed quite the collection. Inexpensive and each time you pop one of those CD’s into the car or your player at home, you are immediately transformed back to your happy travel place! Some of my CD choices from this visit. 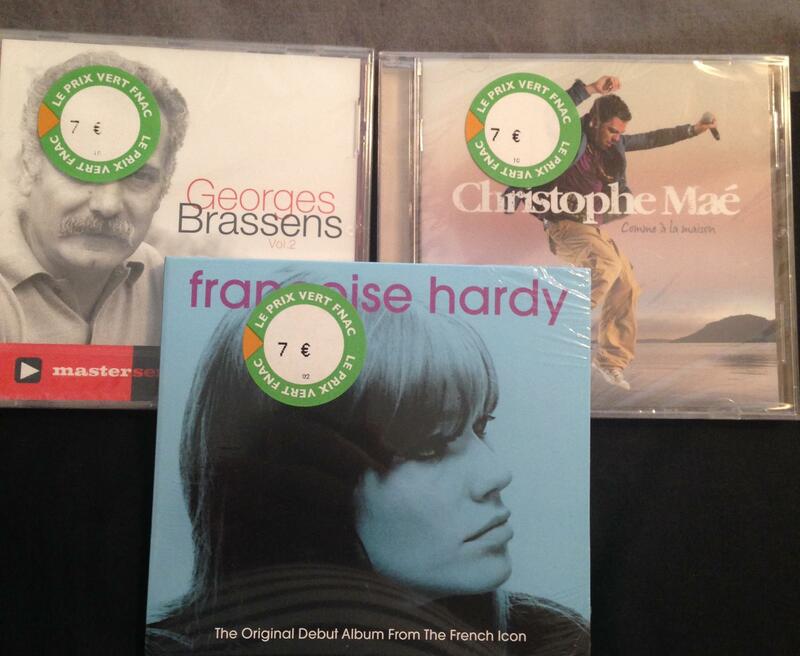 I LOVE the Francoise Hardy CD! It’s always fun to have some French music to remind you of your trip! The next purchase made me nervous. Remember the appetizer that I wrote about yesterday? The one that Bonaparte had? The tartine with the tomato confit and jambon and shaved parmesan? Well, I wanted to try to dupe it. 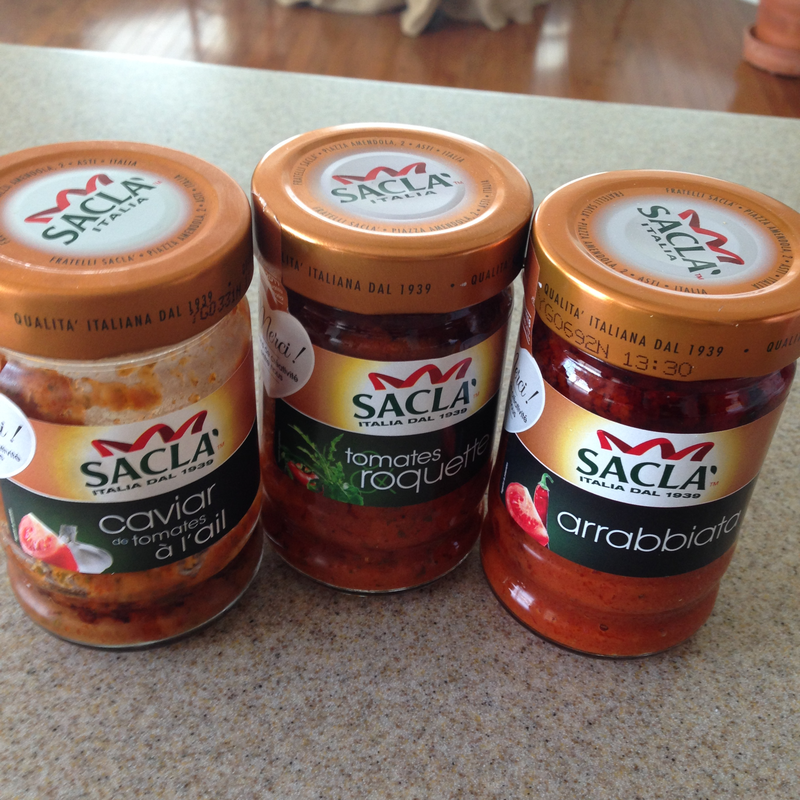 While we were at Geant, I came across these jarred tomato products and purchased them. I wrapped them up in paper towels then in a plastic garbage bag. I, being the wimp that I am, was so afraid that airport dogs would sniff my tomato contraband out and I would be in trouble. But—I took the risk and now am enjoying my tasty little friends. I did try to dupe that appetizer and it turned out pretty good, but the ham over there is just different. Next time I’ll try speck or prosciutto! 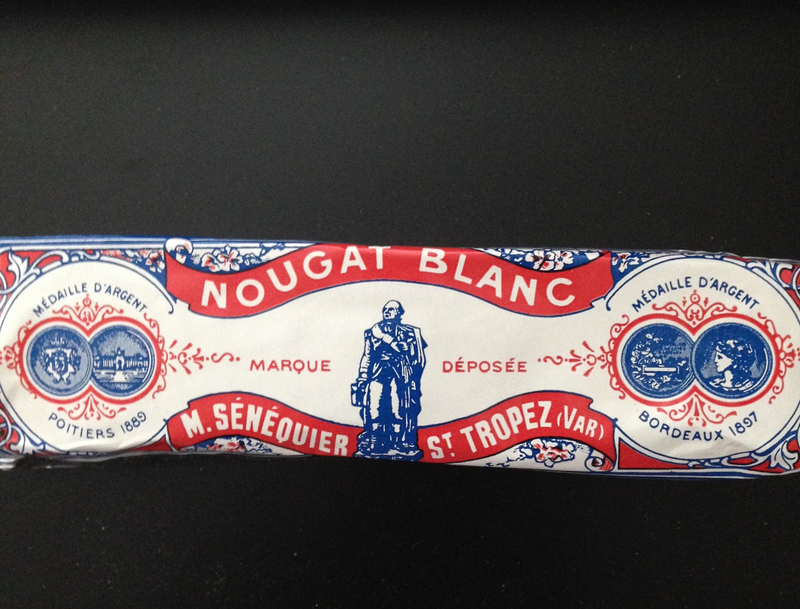 I also picked up some Nougat at Senequier, in St. Tropez, for my girlfriend, Becky. I wasn’t afraid to “smuggle” that in because I bring some back for her every year! It’s a good thing I’m meeting Becky for lunch Monday so I can give her the nougat. If not, Bonaparte will steal it and eat the whole thing! Little grocery sacks from Monoprix, at .18 centimes is a great purchase to bring back for you and to hand out to friends. I should have gotten more! I regret not buying a ton of these. They would make GREAT stocking stuffers at Christmas time! My love for the scent of all things orange blossom never ends. I stocked up on Le Petit Marseillais toiletries. Fleur d’oranger bath products and soap at dirt cheap prices at Geant made me a happy consumer! Inexpensive toiletries are always a great purchase. This brand has a great value for the price. The moisturizer is great, creamy but not greasy! Since I forgot to bring my Fragonard Eau de Toilette in Fleur d’oranger, we were close enough to Grasse to make a run for me to pick some up. However, I changed up my mind once I arrived at the boutique. I used my logic. I already have this scent at home—I also have a huge refill bottle of it. 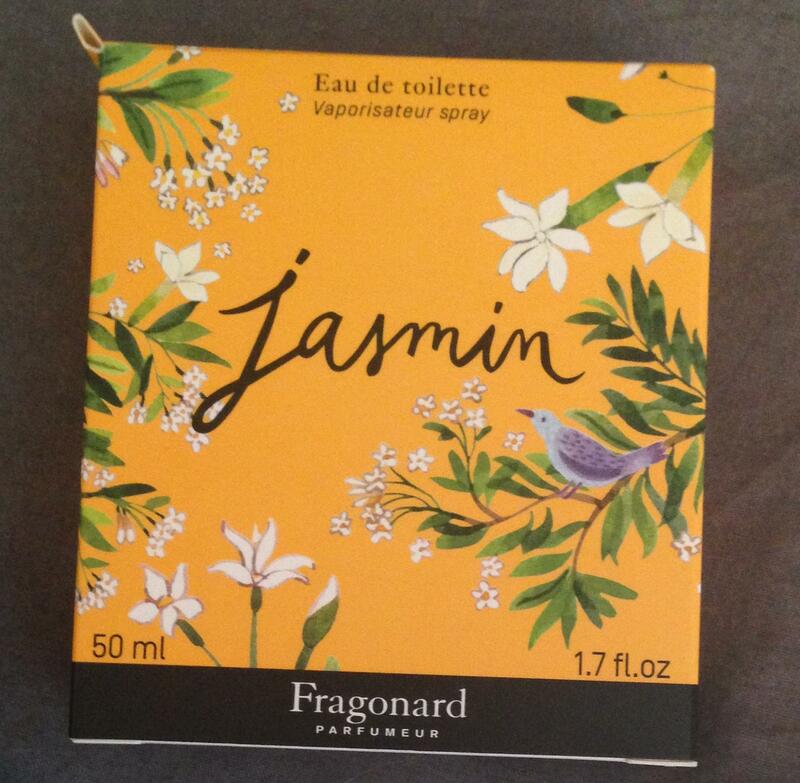 Instead, I spotted a small and very inexpensive bottle of Fragonard’s Jasmine. I was bowled over because the scent of Jasmine flowers reminds me of the Cote d’ Azur –I opted for the Jasmine. I can spray some on and be reminded of the beautifully scented Jasmine that is so fragrant and that grows all over the Cote d’Azur! I also picked up a cute little and very inexpensive shopping tote, some Fleur d’Oranger body lotion because I ran out of it and more Fleur d’oranger soap which are now scenting my drawers at home! This tote is in my car and ready for grocery shopping! A purchase that is incredibly useful! I simply cannot get enough of the Fleur d’oranger scent! Oh jeez–I almost forgot. 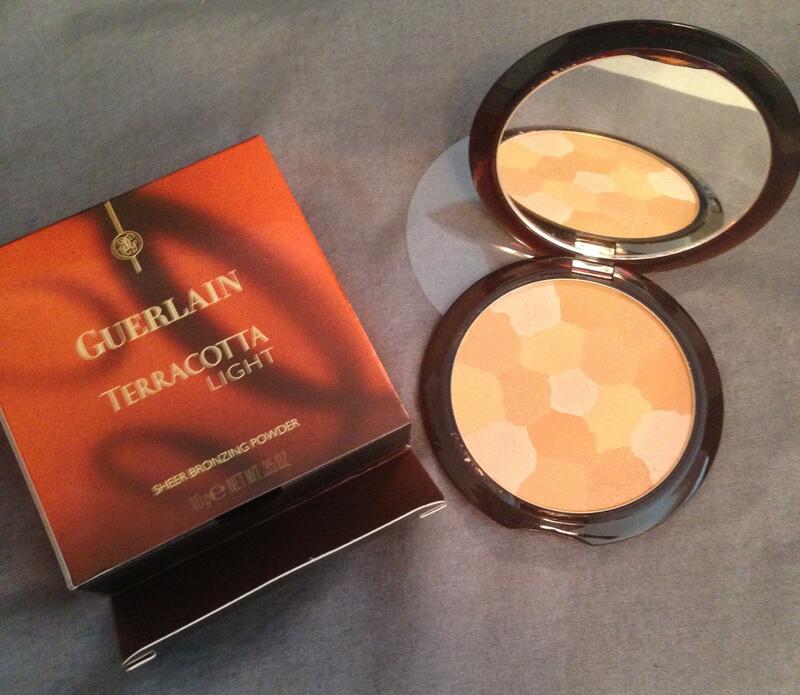 I had a few euros left before boarding the plane so I ended up purchasing this Guerlain bronzer. It was quite the bargain. I’m serious when I say that the airport shops have bargains you won’t find in the regular shops! Traveling is always fun and exciting. And it’s always great to be able to save some money throughout the year for shopping while you do travel. But, if you take the time to think about what you may need or really want, you can come home with great treasures that’ll last long after your travels end—and you will be able to remember those travels fondly when you can incorporate those purchases into your everyday life! Enjoy life–and shopping–and this little song “Oh Oh Cheri” by Francoise Hardy! It’s from the CD I purchased. It’s a remix of her very first record album and it’s a fun song! Ohlala! This entry was posted in Fragonard, Francoise Hardy, French music, French toiletries., Galeries Lafayette, George Bressons, Guerlain, Le Petit Marseillais, Maison des Papillions. Shopping in St. Tropez, Monoprix, Musee dany lartigue, Nan & Nin, Raphael Bedos, Repetto Ballet Flats, Shopping the sales in France. Shopping in Paris. Rondini, Sophie Sacs. Le Movie Snob, Souviners from France, St. Tropez. Rondini sandals. Bookmark the permalink. 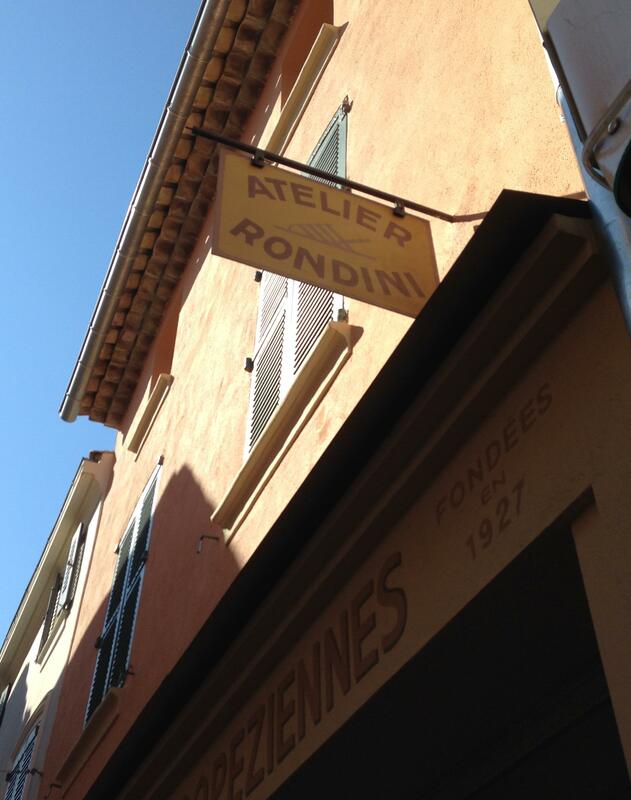 4 Responses to The Magic of Rondini..and Working the Soldes! I am wondering how you managed to bring all those things home with the weight restriction. I usually purchased my music CDs at Virgin Music in Paris but now will have to find another store. 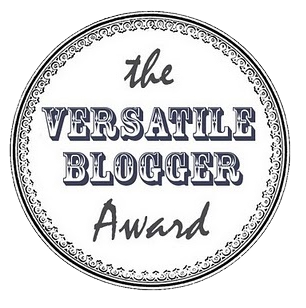 As I have said before, I really enjoy reading your blogs. Irene. When I packed for the trip, I made sure that I had an “allotment” of weight. Trust me, You have NO idea what my carry-on was crammed with. 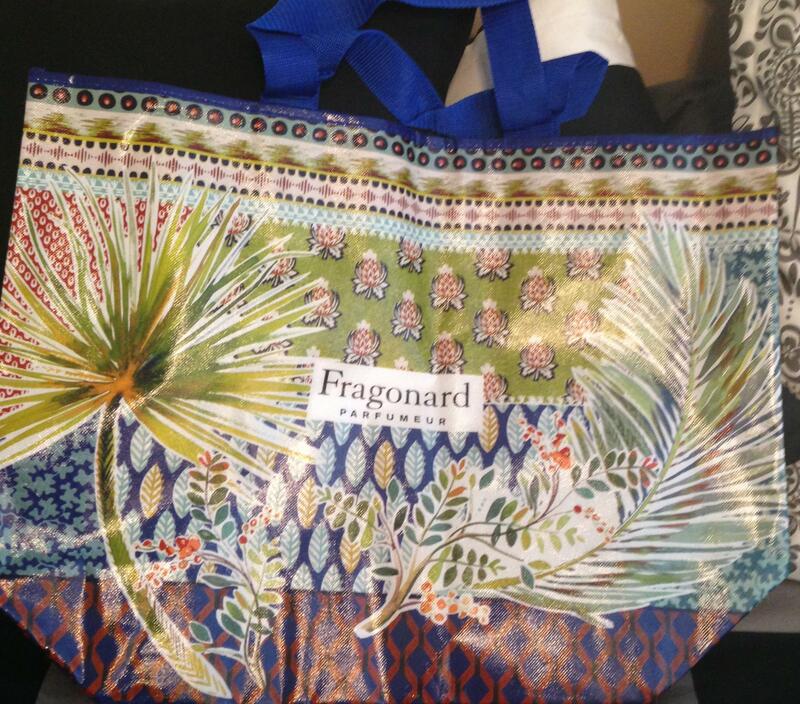 Add to that–I literally stuffed all kinds of stuff and a Longchamp bag into a Lily Pulitzer for Target straw bag. I WAS the original bag lady! I’m like Tim Gunn. I made it work! Like you, I used to get my CD’s at the Virgin Music store. FNAC is the place I purchase my music these days. You can get really great deals. It’s funny, though, because I STILL could have packed half the clothes I packed. Honest to god, when we were in the South, I wore bathing suits and a white shift that I must have worn every other day! 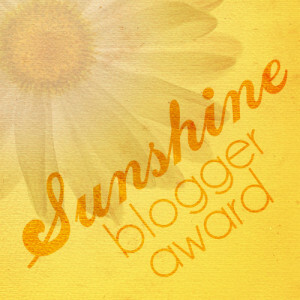 I’m truly happy that you enjoy my blogs. I’ll be working on the return to Paris tomorrow–followed by my summer reading! XOXOXOXO! LOL. Jean, I went to the Nordstrom Pre-Anniversary sale yesterday. I went with an empty wallet because I am on a strict NO-BUY for the rest of the year! Go on to Nat & Nin’s website. You can justify the bag purchase because the N & N bags are still less expensive than a mass-produced Michael Kors or Tory Burch! XOXOXO!